Recent episodes highlight a rapidly deteriorating relationship between the cowboy hat-wearing agriculture commissioner and the Legislature that once counted Sid Miller as one of its own. 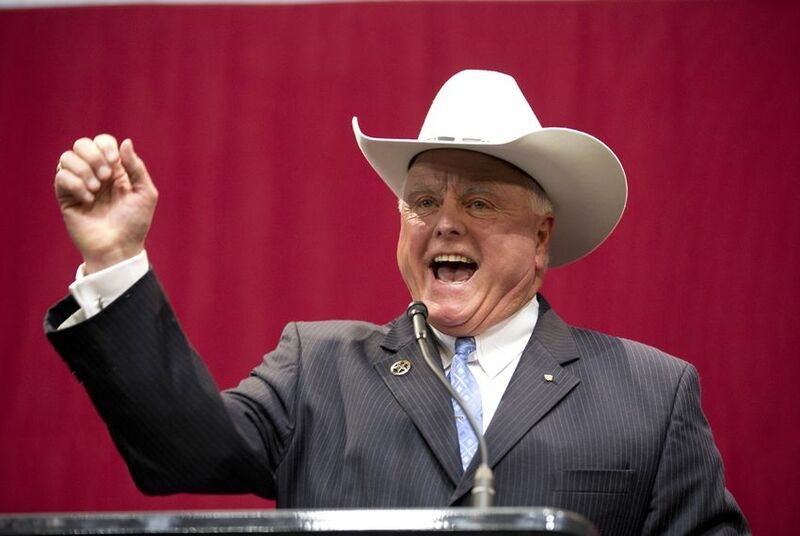 Newly minted Agriculture Commissioner Sid Miller has been generating more than newspaper headlines since he began calling on the Texas Legislature to dramatically boost his agency’s budget. He’s also getting blowback at the Capitol. He was asked to move his car off of Capitol grounds after parking where he wasn't supposed to — and now officials say he's even been denied access to the secured driveway circling the building. And a couple of weeks ago, while pressing his former colleagues to support his request for a bigger agency budget, Miller was asked to leave the center floor of the House chamber — the area inside the brass rails that is generally reserved for current members. State Rep. Charlie Geren, chairman of the House Administration Committee, which handles the chamber’s internal affairs, said it's nothing personal. Miller "wasn't kicked out of anywhere"; he was simply told to follow the House rules. But the episodes highlight a rapidly deteriorating relationship between the cowboy hat-wearing commissioner and the Legislature that once counted Miller as one of its own. Miller has been loudly complaining about the impact deep 2011 budget cuts had on the Agriculture Department and its ability to protect consumers. State Rep. Larry Gonzales, R-Round Rock, who chairs the House budget-writing subcommittee that oversees that department’s budget, said he has agreed to fund additional inspectors and to beef up programs overseeing weights and measures in the private marketplace, including gasoline pumps, to ensure consumers get what they pay for. But he described the style of Miller and other Agriculture Department employees as pushy and said his former House colleague is asking for too much money for nonessential and duplicative services. Meanwhile, another member of the budget-writing subcommittee that oversees Miller’s agency, Rep. Giovanni Capriglione, R-Southlake, said he was surprised and disturbed to learn that the head of Miller’s government relations team has a criminal record stemming from campaign finance abuses in Oklahoma. Walt Roberts, assistant commissioner for legislative affairs and external relations, pleaded guilty to federal felony and misdemeanor charges in 2003. Roberts, a former Democratic state representative from McAlester, Okla., participated in a conspiracy to funnel more than $200,000 into his unsuccessful 1998 campaign for Congress, according to a 2003 U.S. Department of Justice press release. He was sentenced to two years probation and ordered to perform 200 hours of community service. The department declined to make Miller or Roberts available for an interview. But in a written statement, Miller said Roberts — a well-known fiddler and actor who played a role in the JFK movie Parkland — had never hidden his criminal record and had paid his debt to society years ago. He noted Roberts’ work representing the “frail and needy” on behalf of Lutheran Social Services, a nonprofit that helps the disadvantaged, and called him “a trusted and valued employee” in whom he has full confidence. Roberts was hired in November as part of Miller’s transition team. He makes $180,000 a year. Miller said he’s facing a huge backlog of complaints and violations of consumer protection laws his department is charged with enforcing — dealing with everything from the accuracy of grocery store scanners to the overuse of pesticides. He and his government affairs team have asked for a major increase in state general revenue, amounting to almost $50 million beyond the last two-year spending plan. They say they don't consider the request to be new funding but rather a restoration of the budget cuts made in previous legislative sessions. So far, Gonzales, the subcommittee chairman, said he has agreed to fund about $3.2 million of that, including $1.5 million for the oversight of weights and measures used in commerce, to ensure consumers aren’t getting a raw deal. But he balked at the bulk of the funding request, which included millions for marketing and other discretionary programs. “I have never seen an expansion of government and a growth in government so quickly from a new administration,” Gonzales said.